Dermal Fillers Glasgow are popular treatments for wrinkles and facial lines. They can also enhance lips and add definition to your chin and cheeks. Juvéderm Ultra is a new generation of Dermal Fillers from Allergan, a world leader in surgical and non-surgical aesthetic products and is available at Cloud Nine Clinic Glasgow. It’s a natural, biodegradable gel that flows easily into your skin, instantly filling out those troublesome lines leaving a smooth and natural look and feel. So, you’ll notice an immediate difference after just one treatment. WHAT RESULTS CAN I EXPECT FROM JUVEDERM® ULTRA DERMAL FILLER? Juvéderm Ultra 2: Erases moderate lines, especially those around the lips and corners of the eyes and those very close to the surface of the skin. Juvéderm Ultra 3: Smoothes wrinkles between the nose and corner of the mouth and around lips. It can be used very subtly to plump out lips in order to maintain a youthful smile. 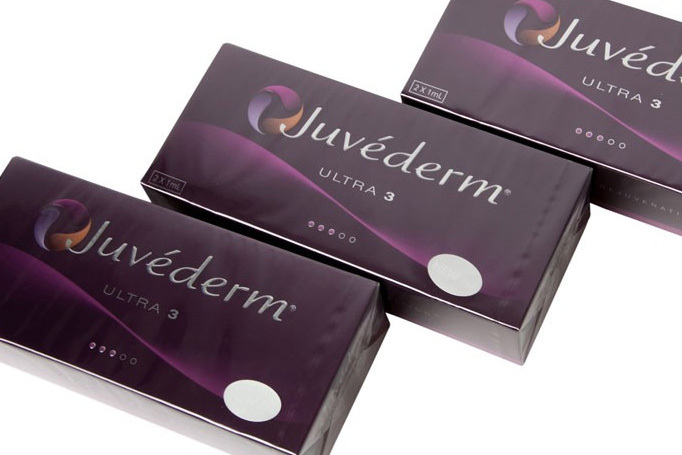 Juvéderm Ultra 4: Works on the most noticeable folds and lines, and improves the contour of the face. Juvederm Ultra Smile: Filler designed especially for lip definition and volume. Juvederm Volbella: longer lasting lip filler (up to 12 months), uniquely designed for a natural look and feel, with less swelling compared to other lip treatments. HOW DOES JUVEDERM® ULTRA WORK? As we age, the underlying tissues that keep our skin looking youthful and plumped up begin to break down, often leaving laugh lines, smile lines, crow's feet or facial creases over the areas where movement occurs. Dermal Fillers can help fill in these lines and creases, temporarily restoring a smoother, more youthful-looking appearance. When injected beneath the skin, fillers plump up creased and sunken areas of the face. They can also add fullness to the lips and cheeks. Dermal Filler treatments at Cloud Nine in Glasgow are practiced with Juvederm Ultra. From the makers of Botox, these products can reduce lines and wrinkles, enhance lips and add definition to your chin and cheeks. They are made from hyaluronan, an organic substance found within your skin which helps to restore the skin’s natural look. They work by mimicking the hydrating and lifting effects of hyaluronan, keeping the skin moist and elastic - and you looking and feeling great. Following a series of light injections, your skin will be supported and flattened for a smoother, softer look. The gallery below shows some of the ways in which Dermal Fillers have delivered outstanding results for our patients. Please slide the handle on the image below to highlight the benefits of choosing Juvederm Ultra Dermal Fillers. There are any number of reasons for why our skin gradually loses its structure- weather, pollution, stress or simply ageing. On top of that our skin contains a moisture-retaining compound, Hyaluronic Acid (HA) which declines with age. These elements combine to create lines around our faces. Our Dermal Filler ranges replace lost HA by injecting a manufactured HA filler, moisturising your skin from the inside and helping to give it elasticity and tone. It can quickly restore your skin's lost volume and smooth away those facial lines. Our fillers are long-lasting gels that, once injected into the skin with an ultra-fine needle, lifts and adds volume to the areas being treated. Similar to one of the body's own natural substances (hyaluronic acid), it is a completely safe treatment. Our Dermal Fillers mimic the hydrating and lifting effect of your skin's natural HA, which keeps the skin hydrated and elastic. They fill in and smoothes away facial lines and acne scars, other skin contour deficiencies, and lost volume. The most appropriate lines to treat with our Dermal Fillers are those that are described as static—this means the deep facial lines you can see when your face is still. Static lines are due to lack of elasticity of the skin caused by sun damage, smoking, and genetics. Botox works in a targeted way to relax the tiny muscles that cause glabellar lines, crows feet and forehead lines- smoothing out wrinkles for around four months. Botox treatments may be used to address dynamic wrinkles—those that are caused by movements of facial muscles due to expressions such as smiling and frowning. What type of Dermal Filler do you use? At Cloud Nine we use Juvederm Ultra and Restylane. Juvederm Ultra is the first of a new category of Dermal Filler, proven to last up to 12 months. It is the first dermal filler of it's kind to contain a local anaesthetic (Lidocaine), making the softlining treatment more comfortable than ever before. One of the benefits of using our fillers is you don't need to wait three weeks for a skin test like you might with other fillers, so you can be treated on your very first visit. The area to be treated will be numbed using a topical cream anaesthetic. Your medical professional may advise that you have a local anaesthetic, especially if you're having volume added to your lips. But since our fillers are injected with a very fine needle, you'll only feel a brief sting, if any. If you are receiving Juvederm® Ultra the anaesthetic is incorporated in to the gel so no cream or local anaesthetic is required. The transparent Dermal Filler gel is injected with a syringe into the mid- to deep dermis of your face. The dermis is the subsurface skin layer that contains connective tissue, nerve endings, sweat and oil glands, and blood vessels. Our fillers use a proprietary form of HA that exists naturally in your skin. It lasts longer than other older formulas - around 9-12 months compared to other fillers which may only last for a couple of months. Length of time a dermal filler treatment will last also depends on a number of factors including; age, the area you have had treated, quantity of Juvederm Ultra injected, quality of skin, lifestyle, healthiness. Is there any recovery period after Dermal Filler treatment? How do I make an appointment for Dermal Fillers? The first step towards getting Dermal Fillers is to book a free consultation with a member of our team. At a consultation, you can expect to see a medical professional, with whom you will have plenty of opportunities to ask any questions you may have about the procedure. The consultation will take around 10-15 mins. There is absolutely no obligation to go ahead with treatment. We understand that this is a big decision for you and we want you to be totally satisfied that it's the right thing to do before committing to book the treatment. You can arrange a free consultation with us by calling 0141 433 0841. Dermal Fillers cost from £180. “I was very nervous about getting my lips done but have been thinking about it for ages as I think they were too thin. I was recommended Cloud Nine by a friend who has been going there for a few years, so thought at least they are reputable! I met Ewan at reception who he helped put me at ease and then the doctor spent quite a long time discussing the treatment and what I could expect. I felt confident in the doctor because of my friend so got the treatment done. It definitely wasn’t relaxing but wasn’t as sore as I thought (I also had an anaethetic cream put on beforehand). My lips were swollen for about 3 days. "As we age, the underlying tissues that keep our skin looking youthful and plumped up begin to break down, often leaving laugh lines, smile lines, crow's feet or facial creases over the areas where movement occurs."